Copyright © The Writers Post 1999-2005. NGUYEN KHAI, pseudonym of Buu Khai, born in Hue in 1940, graduated from the National School of Fine Art in 1963, won the Bronze medal at a Spring Art Exhibition in Saigon even before his graduation. One of the founders of the Young Vietnamese Artists Association -- an active and well-known artist group -- in the early 60's, Nguyen Khai committed himself to painting and found it his only way to probe the depth of reality, his inner state, and to pursue the marvellous. 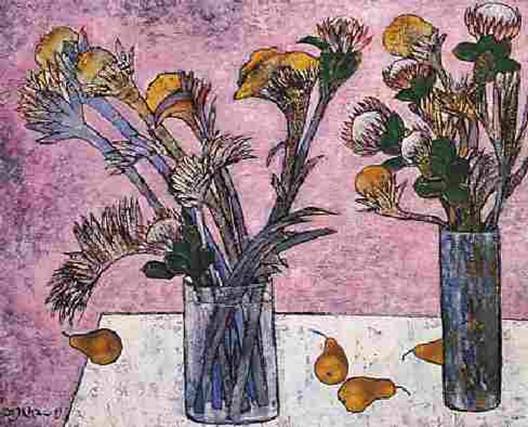 While still in his twenties, he became one of the most famous artists in Vietnam. The fall of the South Vietnam forced him to flee his country in 1981, and settled in the American State of California. The painter resumed his painting, and exhibited regularly since then. His most recent exhibitions were at Hoa Mai Gallery, Paris, French (2004), and Viet Art Gallery, Houston, Texas, USA (2005). Khe Iem, Vietnamese playwright, storywriter, poet, editor. Born in 1946 in Nam Dinh, North Vietnam, he went into immigration in South Vietnam after the 1954 Geneve agreement divided Vietnam into two separate parts and set each part under a different political regime: Communist North and Capitalist South Vietnam. “Hot Huyet”, his debut literary work, a play, appeared in South Vietnam in 1972. Thirteen years after the Communist conquest of South Vietnam in 1975, he escaped Vietnam by boat in 1988, spending a year in a refugee camp in Malaysia before coming to the United States in 1989, where he settled in California. In 1994, he founded Tap Chi Tho, a very successful poetry magazine which is under his editorship until 2004 (Poetry Magazine, US: Premier Issue launched in Fall 1994). He also published his other books: “Thanh Xuan” (poetry. US, California: Van, 1992), “Loi cua qua khu” (story collection. US, California: Van Moi, 1996), “Dau Que (poetry collection. US, California: Van Moi, 1996), “Tan Hinh Thuc, Tu Khuc va nhung tieu luan khac” (literary essay. US, California: Van Moi, 2003). The essay “Contemporary Vietnamese Poetry: On the Path of Transformation” published in this issue is Khe Iem’s presentation given at the most recent four-day annual meeting which is held by the Association for Asian Studies (AAS) in 2004 in San Diego, California. The paper focuses on two periods of modern Vietnamese poetry: 1960 to 1975, and 1975 to the present. Through the views of a poet who conducts Tap Chi Tho Magazine and the Website Tho Tan Hinh Thuc which are supporting Post Modernism and New Formalist poetry (Vietnamese New Formalist Poetry is not to be confused with American New Formalist Poetry in which meter and rhyme still remain - Editor’s note), Khe Iem discusses on how and why Vietnamese poetry transformed, and will transform, in his belief, into New Formalist Poetry. The essay is translated by Joseph Do Vinh. Nguyen Manh Trinh is a member of the editorial board of Hop Luu, one of the most selected magazines published in the US. His publications are: Tho Nguyen Manh Trinh (CA: Nguoi Viet, 1985), Tuyen tap ba muoi nguoi viet sau 1975 (co-authored with Trinh Y Thu (CA: Van nghe, 1989). His poems and short stories appeared in the established literary magazines: The Ky 21, Van Hoc, and Van published in California. Nguyen Manh Trinh conducted several interviews with author, including the interview published in this issue, with Ngo The Vinh, who is the author of 6 books published before or after 1975: Vong Dai Xanh (The Green Belt), published in 1970, Gio Mua published in 1965, Bong Dem 1964, May Bao 1963, ‘Mat Tran O Saigon’ published by Van Nghe Publisher in 1996 in the US, Cuu Long Can Giong Bien Dong Day Song (also published by Van Nghe Publisher. California: 2000), and The Green Belt, a translation version of Vong Dai Xanh translated by Nha Trang and William L. Pensinger (Raleigh, NC: Ivy House Publishing Group, 2004). The interview was conducted in 1996, the text is now translated into Engligh (2004). Ngo The Vinh, born in 1941 in Thanh Hoa, doctor, member of the editorial staff and the editor-in-chief of Tinh-Thuong magazine, a monthly published by the School of Medicine (Saigon University), former 81st Airborne Ranger M.D. during the Vietnam War. His novel Vong Dai Xanh (The Green Belt), published in 1970, won the 1971 National Prize for Literature. Vong Dai Xanh 2nd edition was published in 1987 (California: Van Nghe, 1987). This is the fourth book of the author, after Gio Mua published in 1965, Bong Dem 1964, and May Bao 1963. Vong Dai Xanh is followed by his fifth ‘Mat Tran O Saigon’ published by Van Nghe Publisher in 1996 in the US, a collection of 12 short stories, half of which was written before 1975 in Vietnam, the other half written abroad after 1975, and of which the best-known is the short story ‘Mat tran o Saigon’. His most recent books are Cuu Long Can Giong Bien Dong Day Song (also published by Van Nghe Publisher. California: 2000), and The Green Belt, a translation version of Vong Dai Xanh translated by Nha Trang and William L. Pensinger (Raleigh, NC: Ivy House Publishing Group, 2004). His forthcoming collection of stories ‘The Battle of Saigon’, another translation version, will be published by Xlibris, from which three short stories are first published in The Writers Post and the Wordbridge. “Buddha’s tears” published in this issue is his third appearance in this magazine, after his short story ‘The battle of Saigon’ published in the last issue: Volume 5 Double Issue of Winter 2003 & Spring 2004, and ‘Peace will come no sooner’ in Volume 6 -Number 2, July 2004. Nguyen Huu Tri, short-story writer, professor, translator, interviewer and editor, born in 1936 in NhaTrang (Vietnam), educated at Vo Tanh College (NhaTrang), obtained his Baccalaureate II (1958). Pursuing his higher education, in 1959, he went to the US on the Leadership Training Scholarship (1959-1964), received his BA in English from Miami University in Oxford, Ohio (1962), his M.S in Linguistics from Georgetown University in Washington, D.C. (1964), and in 1981, his Ph.D. in Linguistics from Georgetown University, Washington, D.C. He returned to Vietnam in 1964, and became an Associate Professor of English and Linguistics, taught courses in Practical English, American Literature, and Methodology of Teaching English as a Foreign Language at the universities: University of Saigon (Faculty of Letters, Faculty of Pedagogy, and Medical School), University of Can Tho, and Van Hanh University where he later became, 1966-69, the Director of the Language Center, administered and directed four distinct language programs in English, French, German and Japanese, supervised 14 college teachers of different nationalities. Also, he was an ESL Instructor at the Army Language School of the Vietnamese American Association (under the direction of USIA), and IBM. Saigon. Coming back to and settling in the US in 1969, he worked as a Consultant, IDA, Science and Technology Division (Language and Translation Study) in Washington, D.C. And afterwards, from 1970 to 1971, an Assistant to the Cultural Officer, Embassy of the Republic of Vietnam, Washington, D.C.; from 1971 to 1972, an Instructor of Vietnamese at World Instruction and Translation Inc. (Defense Language Institute contractor), Arlington, Virginia, where he taught Vietnamese to American military personnel; from 1975 to 1976, a Consultant at the National Bilingual Resource Center at the University of Southwestern Louisiana, where he helped many school districts in six Southeastern states set up ESL programs for Indochinese students; and from 1977 to 2002, a Professor at Northern Virginia Community College. Parallelly, from 1972 to present, he was working at VOA as a POV at the Vietnamese Service (1972-1982), and from 1982 onwards, an International Radio Broadcaster (Vietnamese), an interviewer, and an editor. In the field of literature, Nguyen Huu Tri made his name as a writer with the publication of “Thang Ngo” (1992), a collection of Vietnamese language short-stories, which was followed by “An Trua, Nghe Ke Chuyen Tinh”, another collection of stories published by Van (1999). “Linda’s Weekend” is the translation version of the short story “Cuoi tuan cua NG…” from “An trua, nghe ke chuyen tinh”. Nguyen Thi Thanh Binh -- Her most recent book is Dau An, a collection of short stories published by Van Moi Publisher (2004). This is the fifth book of the author, after Tron Vao Giac Mo Em, a collection of poetry published by Thanh Van Publisher (1997), O Doi Song Nay (a collection of short stories) published by Dai Nam Publisher (1989), Giot Le Xe Hai (a novel) published by Van Khoa Publisher, and Cuoi Dem Dai (a collection of short stories) published by An Tiem Publisher (1993). Her poems have appeared in numerous magazines, one of her short stories has been anthologized in "Tho van hai ngoai nam 2000" (CA: Van Moi Publisher, 2000). Nguyen Thi Thanh Binh is presently the editor of Gio Van, a literary magazine founded in 2002 in the US. Thanh Ton, pseudonym of Le Thanh Ton, born on 09-09-1943 in Loc Phuoc, Dai Loc, Quang Nam. Having been mobilized he served in South Vietnam’s Armed Force. After the fall of Saigon in 1975, he was arrested, and sent to a hard labour camp for seven years from 1975 to 1982. Thanh Ton immigrated to the US in 1997, where he resettled. He published his debut collection of poetry “Tinh Nguoi Song Thu” in 1964 (limited edition, co-authored with Hoang Quy and Thai Tu Hap), which was followed by Thap Tinh (Vietnam, Nguong Cua, 1969). Thanh Ton' s short stories and poems appeared in many literary magazines published in Vietnam before 1975. Phan Xuan Sinh, born in 1948 in Nai Hien Tay Da Nang. Former officier in South Vietnam Armed Force. After the South of Vietnam collapsed, Phan Xuan Sinh immigrated to the US, where he settled in Massachusetts. His debut collection of poetry, published in Vietnam, “Chen ruou mung” (co-authored with Du My) was followed by “Boi Tren Giong Nuoc Nguoc” (CAN: Song Thu, 2002). His poems have appeared in magazines published in the US after 1975. Do Xuan Oanh, born in Quang Yen, Quang Ninh Province, North Vietnam on January 4, 1923, into a poor worker family of the coal mine area; self-educated and became a jack-of-all-trades – journalist, painter, writer, social worker, song writer, translator, peace activist etc. Xuan Oanh translated into Vietnamese many American novels, including Mark Twain’s Huckleberry Finn. Also, he translated into English the play Truong Ba’s Soul in the Butcher’s Skin to be performed in the US. He retired in 1990 to continue with music and translation works. Uyen Nicole Duong, pseudonym of Duong Nhu Nguyen, was born in Hoi An Quang Nam, brought up in Hue and Saigon (former capital of South Vietnam). Uyen Nicole Duong received her B.S. in Journalism / Communication from Southern Illinois University, J.D. from University of Houston (Texas), and LLM from Harvard Law School (Cambridge MA). 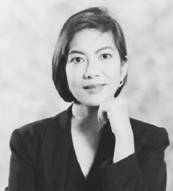 She is believed to be the first Vietnamese Municipal Judge in the United States (Serving in Texas: Associate Municipal Judge, City of Houston, and Magistrate for State of Texas; honoured by the American Bar Association at “Minority Women in the Judiciary” conference – NYC, 1992). Practicing law but she sees herself primarily as a writer, and writes in two languages: Vietnamese and English. Her pieces in Vietnamese appeared in numerous literary magazines, her English's in Song-Van magazine and Pacific Rim Law & Policy Journal. Uyen Nicole Duong's first book 'Mui huong que', a collection of short stories published by Van Nghe Publisher in 1999 was followed by ‘Daughters of the River Huong’ published by RavensYards (2005). Another collection of stories, ‘Chin Chu Cua Nang’ will be published by Van Moi Publisher in the summer of 2005. Her short story The young woman who practiced singing originally published in Song-Van Magazine under pseudonym NhuNguyen Nicole (January-April issue, 1988) won two awards, one of which was the Stuart Miller Writing Award organised by District of Columbia Bar Association, 1988. Her short story The Ghost of Ha Tay published in Volume 4-Number 2-July 2002 was a finalist selection for the Columbine Award of the Moondance Film Festival 2001. Uyen Nicole Duong also writes articles, critiques. Her article "Gender Issues in Vietnam – The Vietnamese Woman: Warrior and Poet" appeared in the Pacific Rim Law & Policy Journal, University of Washington, College of Law, March 2001. Hong Khac Kim Mai, born a descendant of Hong Tu Toan --Thai Binh Thien Quoc on 10-15-1945, educated at College Francais de Tourane (Da-Nang), Lycee Marie Curie (Saigon), and Faculty of Letters – University of Saigon (where she joined the student association of which she was later one of the acknowledge leaders), and SU (US), and afterwards became a professor of Vietnamese literature, and a teacher of piano-playing, at various French Colleges in South Vietnam. Hong Khac Kim Mai escaped Vietnam with her children, and resettled in 1977 in the US, where she became a System Analyst (Oregon, Health Department) and a Data Processing Consultant (DASD). After 1999, she abandoned her job to live her secluded life, and devoted most of her time to her literary pursuits. At the age of 15 Hong Khac Kim Mai started composing poetry, in French and Vietnamese, under her real name Hong Khac Kim Mai. Her poems first appeared in the literary magazine Pho Thong which was then under the editorship of the late poet Nguyen Vy. Her poetry collection Mat Mau Nau published in 1965 interested many intellectual readers in Saigon, and brought her into public notice, before came under attacks for being a work of decadent culture, and was banned by the after-1975 government. Mat Mau Nau, the work for which she was best known, was followed by Nhu Phu Van (poetry), Vo Thap (science fiction). Hong Khac Kim Mai writes in Vietnamese language, and recently in English. The short story Face To Face published in the last issue is originally written in English, and later in Vietnamese (the Vietnamese version entitled ‘Giap Mat’ appeared in Nguon magazine, issue 3, June 2004). ‘Unlimited Prosperity’ published in this issue is also written in English and Vietnamese (the Vietnamese version entitled Sung Man Vo Han Dinh). Hong Khac Kim Mai is a woman of broad cultural interests. She composes music and spends time on painting. Tim Noi Suoi Thuong is her collection of songs. In the US, her poems and short stories appeared in the established literary magazines: The Ky 21, Van Hoc, Van, Song Van, Wordbridge, Tap Chi Tho, and recently the new monthly Nguon published in California. Que Son, pseudonym of Ho Ngoc Son, who was born Nov 25, 1960 in Da Nang Viet Nam. “One Spring morning” is a fragment of his memories about events of spring 1975 as they took place in Da Nang, his hometown, seen through the eyes of a fifteen-year-old boy. Que Son lives in Brooklyn, New York. 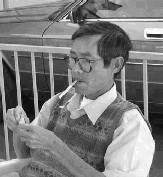 Nguyen Ba Chung, poet and translator. He is the co-author (with Kevin Bowen) of “6 Vietnamese Poets: poems by Y Nhi, Nguyen Khoa Diem, Lam Thi My Da, Nguyen Duc Mau, Xuan Quynh, & Pham Tien Duat”, and “Distant Road: Selected Poems of Nguyen Duy”. His work has appeared in The Boston Review, Compost, Manoa, The Nation, New Asia Review, among the others. Nguyen Ba Chung lives in Boston, where he works at The Joiner Center for the Study of War and Its Social Consequences of the University of Massachusetts at Boston. Kevin Bowen, writer and translator, Director of the William Joiner Center for the Study of War and Its Social Consequences at the University of Massachusetts-Boston, author of “Forms of Prayer at the Hotel Edison”, and “Playing Basketball with the Viet Cong” which is chosen by The Progressive magazine a “pick of the year”. In the translation field, he is the co-author (with Nguyen Ba Chung) of “6 Vietnamese Poets : poems by Y Nhi, Nguyen Khoa Diem, Lam Thi My Da, Nguyen Duc Mau, Xuan Quynh, & Pham Tien Duat”, and “Distant Road: Selected Poems of Nguyen Duy”. Kevin Bowen lives in Dorchester, MA. N. Saomai, born on 19 February 1940, started his writing in the early sixties, contributed to newspapers as a freelance writer based in Saigon, and to a monthly as a staff writer (from 1968 to 1971). His pieces were then published pseudonymously under different fictitious names. He completed four novels (written in the period from 1962 to 1975), which remained unpublished during the Viet-Nam war. 'Can Nha', a novel having got past the military government's censors of the press, been ready to be published in 1974, was published 23 years later in the US, periodically in Song-Van [USA: Song-Van (ISSN 1089-8123), 1996-1997] and in book form in December 1997. Several excerpts from the novel were republished in Van magazine, (CA: Van Magazine, 1999), and in the anthology 'Tho van hai ngoai nam 2000', (Canada: Viet Thuong, 2000). Another novel, 'Bon no le trong den tho', was also published periodically in Song-Van, issue 15, but this is the last issue before the discontinuity of the magazine in December 1999. N. Saomai is the founder, publisher and editor-in-chief of the magazines: Song-Van, The Writers Post, and Wordbridge. Both during the fighting and after the voice of the South Vietnamese has often been ignored. 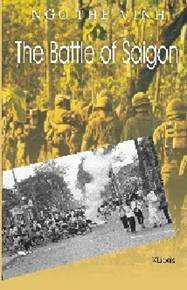 ‘The Battle of Saigon’ should interest, and move, anyone who is interested in the fate of Vietnam. This is a generous and perceptive book. You will find yourself slipping into the mind set of the soldier doctor, prisoner in the gulags and liberated uprooted refugee through to nascent middle class American. A perspective totally neglected in prose so far. TIM PAGE - Former correspondent of Time-Life. A novel by Uyen Nicole Duong, author of Mui Huong Que (Mui Huong Que was published under her real name Duong Nhu Nguyen), to be published soon by RavensYard Publishing, Ltd. The book is due to reach the market in the first quarter of 2005.